On the morning of July 23, Dr. Elizabeth Tarira, director of St. Albert’s Mission Hospital, died after a lengthy battle with breast cancer. Dr. Tarira was a tireless force for good in Zimbabwe. In all that she did she put her love of the people first. Elizabeth was many things to many people – healer, counselor, friend, mentor, sister and daughter – but to those of us at Better Healthcare for Africa, she was an inspiration and role model. As St. Albert’s Mission Hospital moves forward after the loss of its beloved director, we must keep the staff of the hospital and the people it serves foremost in our minds. Dr. Elizabeth Tarira (right), her mother, Evelyn Chakaipa Tarira (center) and sister Juliet in 2009. Elizabeth Tarira was born March 24, 1951, in Chegutu, 56 miles (90 km) fromHarare, to Evelyn Chakaipa Tarira and Philip Tarira. Her father, a farmer, and her mother were members of the Salvation Army, her father achieving the rank of major. When Elizabeth was 18 years old, her uncle, Father Patrick Fani Chakaipa, arranged for her to visit All Souls Mission Hospital in northeast Zimbabwe to witness the work of Dr. Luisa Guidotti Mistrali. Luisa was an Italian lay missionary who belonged to the women’s lay medical missionary organization, the Associazione Sanitaria Internazionale, or International Medical Association. 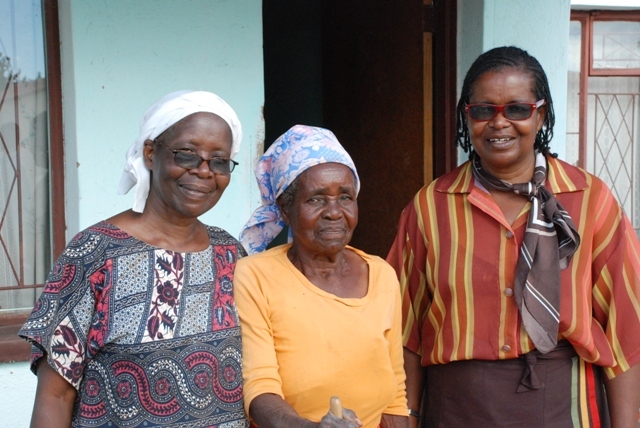 Soon after, the young Elizabeth accompanied Dr. Luisa to Mutemwa, a leper colony 9 miles (15 kms) from the hospital. The Shona name means “You are cut off.” The visit changed her life. In 1982, Elizabeth was awarded her medical degree from the State University of Rome, and the following year she began working at St. Albert’s, where she was the only doctor overseeing the hospital and six clinics. She spent two years in the late ‘80s at Mary Mount hospital near Mozambique caring for refugees fleeing the war in Mozambique. Returning to St. Albert’s, her accomplishments included starting the home-based care program in 1991 for families coping with AIDS and other life-threatening illnesses, earning her Master’s in Public Health at the Tropical Disease Institute in Antwerp in 1998, becoming District Medical Officer and director of St. Albert’s in 1999. Throughout her time at St. Albert’s, Elizabeth oversaw the growth and expansion of the hospital, with the number of outlying clinics growing to ten, all to cope with a growing population in the Muzarabani district. Elizabeth was joined by Dr. Neela Naha, an obstetrician-gynecologist in 1994, and by Dr. Julia Musariri, who specialized in the care of HIV patients, in 2000. In 1999, she began the farm project to provide food for the hospital. Around this time, she and the hospital began a program to keep orphans in school. In 2001, she initiated a mother-to-child HIV prevention program, the first in rural hospital in Zimbabwe, and it demonstrated that such a program was practical for rural areas. In 2004, she fought to keep the hospital open against a long-running drought by building an earthen dam to block a seasonal stream and create a reservoir. She then oversaw the installation of a water filtration system to provide clean water to the hospital, the rest of the mission and to the community if the need should arise. In 2009, the hospital had 140 beds, admitted 4,460 patients, provided antenatal care to 809 women, and by 2010 was helping 625 orphans remain in school. These accomplishments – and there were many more than those highlighted here – were aided by financial and material support from a generous individuals and organizations in Italy, Germany, the European Union, the United States – including Better Healthcare for Africa – and elsewhere. Elizabeth was a tireless and charming fundraiser, diplomat and educator (she was remarkable dedicated and driven to improve the broader public health, as well as aid her hospital). But she was also promoting solid, honest and reliable work. To visit St. Albert’s, meet the staff and weigh the achievements against the meager resources and prevailing economic and social conditions was an experience that invariably motivated a visitor to ask “How can I help?” And that is not likely to change. In 2002, Elizabeth developed breast cancer. It returned in 2009 and required a second surgery followed by drug therapy. The disease remained with her off and on for the remainder of her life. Her funeral was Wednesday, July 25th. She was interred on the grounds of St. Albert’s Mission Hospital. Elizabeth will be impossible to replace, but to truly honor her memory we must redouble our efforts to help those to whom she dedicated her life and service. She chose to end expensive treatments that may or may not have prolonged her life and to return to Zimbabwe and her beloved St. Albert’s hospital. She knew her time was finite. She chose to work, to serve, for as long as she could at St. Albert’s, for the Zimbabwe Catholic Health Commission and for the poor and the sick of her nation. She spent her final days surrounded by family and friends and under the loving care of those who, at Elizabeth’s side, have kept St. Albert’s going through times that required great courage and times of joy and celebration: Dr. Julia Musariri and Dr. Neela Naha, Melania Nyamukuwa and others who, like Elizabeth, are members of the Associazione Sanitaria Internazionale and have dedicated their lives to providing medical care to the poorest of the poor. They will carry on their work at St. Albert’s, and Elizabeth’s influence will live on through them. Elizabeth’s passing brings tremendous sadness to all at the Associazione Sanitaria Internazionale, to the staff of St. Albert’s, to Elizabeth’s family, and to all who knew her or knew her work. But we can give it meaning by helping St. Albert’s continue to care for those in need in the community she so loved. If you feel moved to honor Elizabeth, please consider doing so by supporting her work through BHA or another of the hospital’s partner organizations. Elizabeth would not have wanted us to cry for her; instead, she would want us to continue her work, and it is by doing so that we honor the life of this truly extraordinary woman. Fantastic article, well presented, thank you. I had the honor to work with Dr. Elizabeth, first as the Diocesan Catholic Development Coordinator (1982 – 1999), then as the Home Based Care Coordinator at St Albert’s (1999 – 2001) and finally as the PMTCT Coordinator where we piloted the prevention of mother to child transmission of HIV in a rural setting (2001 – 2006). On the day of her funeral, hundreds of villagers from the Zambezi Valley walked hundreds of Kilometers through the escarpment to pay their last respects. And true to the article, she was an inspiration to us all. May her soul rest in peace.